Adding to the anticipation is the rematch between four-time champions New Zealand and New Caledonia, with the All Whites keen to get avenge their 2012 OFC Nations Cup loss to Les Cagous in Honiara. As a member of the side that suffered that 2-0 defeat four years ago, New Zealand captain Chris Wood says this is a prime opportunity for his side to get one back. “We were disappointed four years ago with what happened,” Wood recalls. “They were a very good side back then and they’re a very good side now. New Caledonia captain Bertand Kai has been on the side of defeat and victory against New Zealand and is only too aware of the task ahead as they attempt to make it two OFC Nations Cup finals in a row. “Four years ago we beat New Zealand in the semi-finals,” he remembers. The two sides have experienced different paths to the semi-finals. While it wasn’t without challenges for New Zealand, they became the only team to progress with the full nine available points giving them a certain advantage. And while New Caledonia may have been held to two draws they’ve looked incredibly threatening in attack and relatively solid at the back. They’ll be without lanky midfielder Cedric Sansot who sits out the match with a suspension however the side has depth. Coach Thierry Sardo was able to rest central defender Jean-Brice Wadriako against Tahiti, and both Georges Bearune and Jefferson Dahite made impressive entries into the match in the second half. New Zealand has a full complement to choose from with captain Chris Wood keen to make himself available for the encounter following his shoulder injury. A number of key players were rested against the Solomon Islands, including Luca Prelevic who has had an outstanding campaign so far, Themistoklis Tzimopoulos and Bill Tuiloma. Coach Anthony Hudson has indicated his pleasure with how the campaign has progressed thus far and will confident come kick-off that his side will go out and do the business to keep their hopes for a fifth regional title alive. The second semi-final has Papua New Guinea taking on neighbours Solomon Islands in what is shaping up to be an historical moment for the host side. Having qualified for their first OFC Nations Cup semi-final, coach Flemming Serritslev is hoping to continue going where no PNG side has gone before – the final. It will be a difficult task but not an impossible one. “I believe the chances will be 50-50,” Serritslev says. What will make things both easier and more difficult is having the competition played in Port Moresby. “It puts more pressure on us,” Serritslev explains. “You are a slave of your own success. On the other hand we have great support from our fans and this will help us to perform. 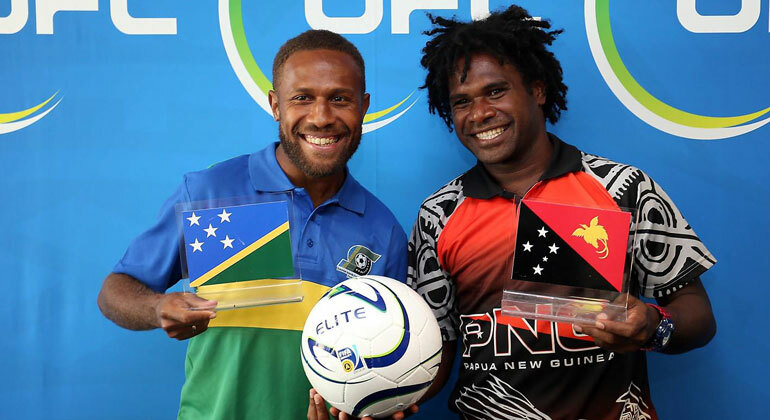 For Solomon Islands tomorrow marks their fifth appearance in the OFC Nations Cup semi-finals, and an opportunity to progress that captain Henry Fa’arodo doesn’t want to waste. “We were in this position four years ago and unfortunately we suffered a loss to Tahiti back then,” he says. Solomon Islands had a bumpy ride to the semi-finals with a single goal seeing them out of the group stage ahead of Fiji. While renowned the world over for their flair on the field, with Auckland City FC coach Ramon Tribulietx assisting the coaching staff a much more solid defensive approach has been adopted giving a new and interesting element to the side’s game. “Ramon has done a review of our game against New Zealand and we’ve gone over it with the boys so I think they’ll be ready come tomorrow,” Solomon Islands coach Moses Toata says. For Papua New Guinea, the influence of former Denmark coach Serritslev has had a visible impact on the side and their approach to football. With the majority of players coming from just two clubs, albeit very successful domestic clubs, it would have been easy to assume that the side would play as they do in the National Soccer League. But with some experienced journeymen as well as youthful up-and-comers, Papua New Guinea has assembled a side that is more than capable of pressing for the title. The Komolong duo at the centre of the defence has proven difficult to break down, while the attacking force of Tommy Semmy, Raymond Gunemba and Nigel Dabingyaba has impressed. The players: Luka Prelevic has made an impressive mark on the national team during his time in Port Moresby. His performances have shown him to be a calming influence with strength in defence and on attack. Striker Rory Fallon has proven himself as a sturdy target man in the 18-yard box and will no doubt play a key role against the All Whites French foes. The vital statistics: Despite sitting out one of the three group games with injury, Chris Wood remains New Zealand’s top scorer so far with three. The nine goals they’ve accumulated have been spread across six players. The players: Bertrand Kai continues to cause problems for defenders with his defence splitting runs. Although he’s put the ball away just once so far, he’s by no means one to take lightly. Roy Kayara had a blinder against Tahiti, drawing his defender before whipping around them and delivering some incredibly dangerous crosses. He too will be one New Zealand will have to contain on the counter-attack with his pace and driving runs in possession a hassle to those trying to defend against him. The vital statistics: In 30 senior internationals dating back to 1951, New Caledonia have won just 11 of those encounters, scoring 45 goals to New Zealand’s 68. The players: Tommy Semmy returned with a bang to the line-up against Samoa, looking well rested and determined to make amends for his suspension. The trio from Lae City Dwellers – Raymond Gunemba, Nigel Dabingyaba and Michael Foster – had a huge influence on the match, scoring more than half of the side’s eight goals. They’ll be looking to use their pace and accuracy to the best of their ability again. The players: Henry Fa’arodo is showing no signs of ageing as he commands his side from the midfield. The speed in which the side counter-attacks through Micah Lea’alafa, James Naka and Joses Nawo is a sight to behold and should they continue in a similar vein they’ll cause trouble for the PNG backline. The vital statistics: Previous results fall firmly in Solomon Islands favour with the side having won ten of their 18 encounters.